Thesis: Designing an environment that engages and stimulates employees through the five senses leads to a more productive work environment. Since the invention of the cubicle, mundane office life has plagued the workplace. Employers have made efforts in trying to make the office a more comfortable and productive working environment but most see it as an extra expense. 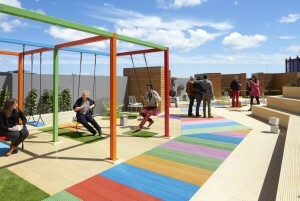 Big corporations like Google have built office spaces essentially comprised of adult playgrounds so that their employees feel appreciated and enjoy their working environment. While this seems great, what about the small businesses that cannot afford to build outlandish spaces? Designing an environment that engages and stimulates employees through the five senses leads to a more productive work environment. Studies have shown that designs that respond to a greater number of senses are more successful than those that only engage one or two. Jinsop Lee, an industrial designer, gave a TED talk in 2013 about design that engages the five senses. He explained using his own sensory chart that designs that included all five senses resulted in better experiences than those that just responded to one or two. The example Lee used was a project he had in college. The professor asked the class to design a clock that used the sun. While Lee thought he was clever in using a sunflower, his classmate was more successful because he used cups of scented oils to tell the time. By appealing to more than one sense, his classmate made a more desirable and ultimately more successful product. It is important for the senses to be considered in design, especially in an office, and many of the strategies for doing so can be done on a budget. The ability to appeal to the senses in architecture, specifically in small business offices, creates more engaging spaces that people want to inhabit. For a small business just starting out, office design may be the last thing on the list to fit into the budget. As long as there is a place to work the work will get done and for a short term this may be suitable, but for a business looking to be successful and productive long term it is necessary to create an environment that employees feel comfortable in. On the other hand, spaces can become too engaging and result in distractions. Placing a ping-pong table in the middle of a work space for example, may promote a fun and active atmosphere, but it can also be a temptation to play rather than work. There needs to a balance so that workers enjoy the space they spend a large portion of their day in, but can also do the job they are employed to do. Designing a space to be visually pleasing is one of the most common ways to create an interesting space. People like to be visually engaged with their environment and one of the simplest and cost effective ways of doing this is by incorporating color. Offices are now painting their walls with bright colors both to “reflect employee tastes and personalities, plus company mission and culture” (Mokop). According to Heather Holz, bright colors have been proven to improve focus and energy. It has also been noted that different colors evoke different emotions and therefore their evocative nature should coordinate with the space in which it is used. For example, blue reflects a quality of calmness so it should be used in spaces like reading rooms or personal offices. Colors such as orange and yellow are more stimulating so they should be used in spaces such as conference rooms that generate a lot of discussion and collaboration (Holz). Another very important aspect to a healthy and productive office environment is natural light. Sabret Flocos, former founding principle of FOX architects, said, “being able to see the outside world has restorative influences” (Holz). Stephen Kellert, a professor at Yale University who focuses on the interaction of humans and nature, also argues that people enjoy spaces that utilize the natural environment and by using translucent materials such as glass to provide an abundance of natural light, the work environment will be enhanced. A well-lit working environment is not the only benefit from the use of natural light; it also can contribute to solar gain, which in turn lowers heating costs and creates a sustainable environment. By making these simple changes, small businesses can save money and provide an enjoyable work environment. One downfall is that most startup companies are not able to build brand new buildings; therefore, renovating their existing space is the only option. Because the advertising agency Superheroes in Amsterdam, Netherlands, had a short-term lease they did not have a large sum of money in the budget dedicated to office space. 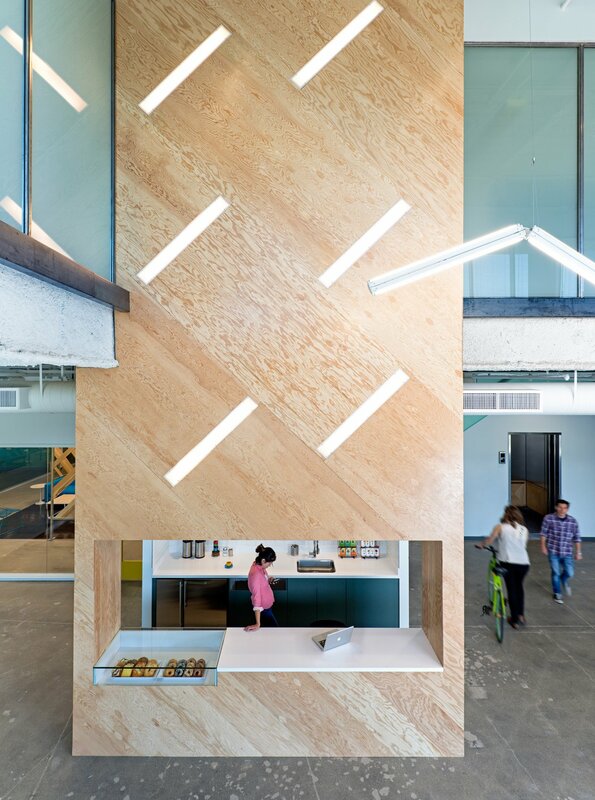 Due to the expense of glass and other construction costs, the firm Simon Bush-King Architecture & Urban took this challenge and used OSB with CNC cutouts to break up direct views and let light into the office space of Superheroes. The material not only provides economical benefits but also provides an interesting backdrop for the office. After sight, sound is one of the most important factors to consider in an office. The open plan concept is popular because it allows flexibility and promotes collaboration; however, workers tend to get distracted or annoyed by phone calls and surrounding conversations when they are trying to work. One way of avoiding this would be to organize the space into zones. By placing activities requiring collaboration together in one space and work that requires more individual concentration in a more private setting, employees are able to focus on the tasks at hand. Because space can be tight in small offices, dividing the workplace into zones may not be feasible. Using materials that absorb sound such as plants, cork, or felt can also separate spaces in an open plan. 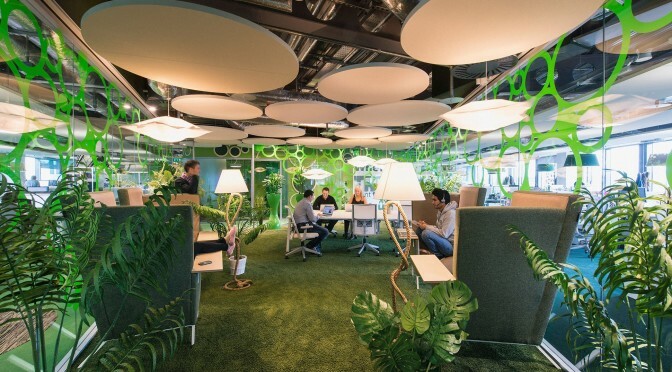 For example the use of plants to divide spaces will help damper the conversation in an area instead of reverberating throughout the office while also promoting a healthy environment through natural air filtration. Because plants require constant maintenance and do not absorb a majority of the sound, another option is to use felt. Felt absorbs sound thus creating a quieter environment. Studio O+A used a felt installation on the ceiling in the startup company Livefyre’s engineering workspace. The engineering department wanted the best of both worlds, collaborative and individual spaces in one. To create the individual spaces, they designed soundproof booths in the walls that are both silent and comfortable. Limiting spaces divided by hard walls will help to lower sound reverberation, thus creating a less noisy and more productive environment. Another sense that tends to employ difficulties is smell mainly because people are sensitive to changes in scents. However, the sense of smell is extremely powerful in triggering memory. “The most persistent memory of any space is often its smell” (Pallasmaa). One way to stimulate the sense of smell in the office is by lighting candles or by having certain potted plants that give off a pleasant aroma. The use of plants also doubles as a sound barrier therefore the senses of sound and smells are appealed to creating a more dynamic space. By placing different scents throughout the office it will provide awareness of the different spaces and serve as a marker to employees and visitors alike. 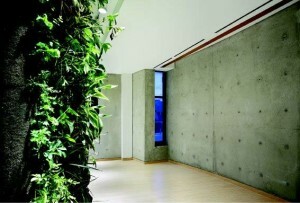 For example, the Toronto University the Multi-Faith Center uses a green wall with plants that give off a pleasant aroma. Behind the wall runs an HVAC duct that blows the scent into the meditation room providing a calm and relaxing space. Although this is not an office space, this system could be employed in the working environment. People are fascinated by the sense of touch hence the creation of the Please Touch Museum. Texture can really set the mood for a space. Carpet and wood create a homey feeling whereas, steel, glass, and hard stone have a sterile feeling. 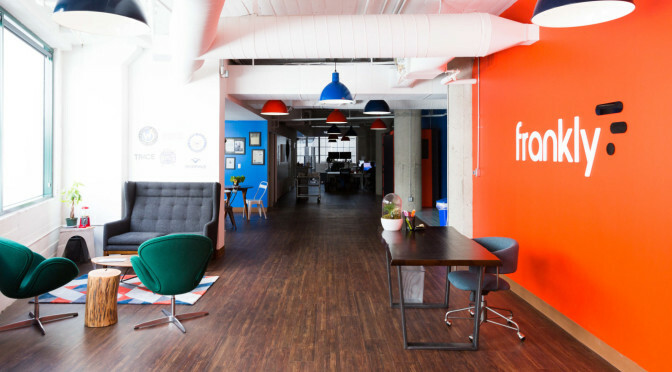 Livefyre’s office creates a homey feeling for its employees by using materials typically found in their employees’ homes such as wood and area carpets. Designing for touch is important because people are in constant contact with the world around them, so creating a space that is comfortable to the touch reflects people’s mood. Creating an enjoyable and comfortable workspace for employees is the most important thing a company can do to increase worker satisfaction and ultimately result in a more productive work environment. As designers we have the ability to put this thought into action. Designing spaces that focus on all of the senses could lead to innovative office strategies that are not only engaging, but economical as well. Large companies such as Google have the capital to convert all of their workplaces into lavish, colorful, and playful spaces, but enjoyable working environments should be experienced by all businesses. Small companies such as startups do not have the extra money to use on office design; many are just getting started and need to invest in more immediate expenses. However, “…workplace design should be considered a driver of employee output…” (Boucher). Employee comfort should be part of the initial business expenses because the health and wellbeing of a company’s employees is the backbone of a company’s productivity. Pallasmaa, Juhani. The Eyes of the Skin: Architecture and the Senses. London: Academy Editions, 1996. Holz, Heather. Sensory Architecture: Redefining How One Interprets Space. Fargo: North Dakota State U, 2011. “Engage the 5 Senses to Inspire Workplace Productivity.” Convene.N.p., n.d. Web. 27 Sept. 2015. Kellert, Stephen R. Building for Life: Designing and Understanding the Human-Nature Connection. Washington: Island, 2005. Print. Magazine 8 Feb. 2014: n. pag. Web. 11 Dec. 2015. Bridget approached this project by creating a long pathway through the site running from the busy streets of the East to the waterfront on the West. She has also created a path from North to South for pedestrian traffic flowing through the park. Her main design idea is to bring the employees of the fire company and the community together through a main central plaza while also framing views within the site and focusing on the view of Manhattan across the East River. She has also created a system using solids and voids to “create a dialogue between the public and private spaces” within the site. This system also provides various views within the site ending with a picturesque view of Manhattan at the end of the pathway leading to the park. The main plaza Bridget has decided to anchor her project with is flanked on both sides by her two main structures. The structure on the North side of the site houses the apparatus bay facing Quay Street and the building on the south side houses the education center. The plaza running through the center of the space provides views into both buildings so that the community can watch the firefighters in action while also making their way to the Monitor Museum and park at the end of the pathway. While travelling on this path through the site, the viewer also has a framed view of Manhattan that opens up at the end of the path. Bridget approached the site with the concept of using solids and voids to define the spaces and create a dynamic interaction between the community of Greenpoint and the private community of the firefighters. She accomplishes this goal by creating a central “void” or inviting plaza, that brings the public in off the main, busy road of Franklin Street. Upon entering the site from the East on Franklin Street, one is guided through the ‘void’ in the site along a path that provides views into both of the “solids”, the apparatus bay on the right and the education center on the left. This space is inviting because the roofs of the structures are sloped upward creating an openness that does not make a visitor feel crowded. 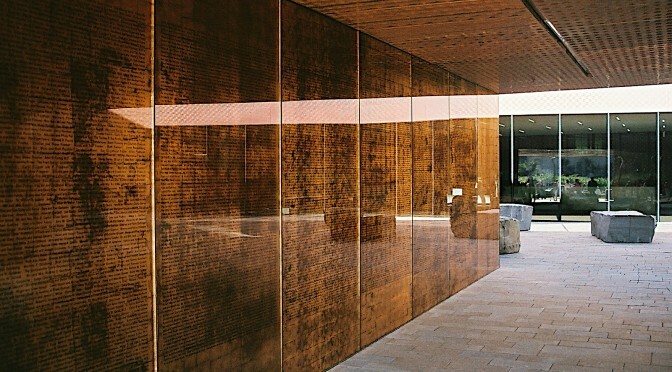 The use of translucent materials on the ground floor of the buildings also creates an openness for visitors and allows them to engage with the space. However, I think this space falls short in its attempt to provide more interaction between the public and the firefighters. While the space is inviting and the material palette chosen allow the public to view into the spaces, there really is nothing stopping people from simply just walking through straight to museum or park. The jurors had also mentioned that there are no places of pause within the site that prompt people to stop and look into the various spaces. In order to prompt people to stop and actually engage with the space I would suggest placing benches or providing an area located off of the main path for people to gather and watch or speak with the firefighters. By creating moments of pause within the site, the spaces become more dynamic and the goal to create an interaction between the community and the firefighters will be strengthened. A major source of discussion between the jurors was the roofs of the buildings. Both buildings had sloped green roofs for sustainability as well as to give the illusion that they were a continuation of the landscape. While the jurors appreciated the nod to sustainability, they did not understand why the roofs were “flying” in some instances and boxed in in other places. The jurors explained a choice needed to be made as to whether the roofs will be “flying” or boxed. I would suggest maintaining the “flying” roof. Although I understand why the parts of the roof were boxed in, I think the overhangs will strengthen the project and help to reinforce the idea that the buildings are part of the landscape and blend in with the natural environment of the park. By choosing this scheme, the outdoor terrace on the second floor housing the residences above the apparatus bay will need to be reconsidered. I would consider maintaining a roof across the entire terrace with cutouts to allow light or maybe adding overhangs on the first floor to maintain continuity between the first and second floors. The last thing the jurors commented on were the choice in materials as well as the details of the landscape. The main comment about the materials was that the choice in weathered wood seemed out of place for the context of the project. The weathered wood gave the impression of a rural site and the jurors that it was strange. They suggested making it look less rustic by implementing a rain screen system or using it as a shading system depending on its location on the exterior. They said to consider the context of the project and choose materials based on the message wanting to be conveyed. The other comment about the materials was to base the materials based on the function of the space meaning specific materials could suggest different functions within the building. In terms of the wood on the exterior I agree that it looks out of place but I think that is one of the reasons why I enjoyed it. I like the rustic looking wood because it provides a nice break from the vast amounts of glass curtains and steel framing plaguing the surrounding area. However, I would take the jurors suggestion and really consider the message the building wants to make and choose materials accordingly. If using wood cladding is important to the concept then I would consider a paneled rain screen system or a wood cladding system much like the Belmont Street Lofts in Portland, Oregon. Overall I think the project has a very strong foundation and with a few minor changes could be even better. The critics agreed that the project has a strong concept and is convincing but the decisions made within the project need to reflect the concept better. In other words how does the entire project relate to itself and the concept proposed at the beginning. Just a minor side note, the organization of the second board for presentation needs to be reconsidered! It is a bit difficult to understand but I do like the “path” dividing the drawings. Overall Bridget had a very informative and insightful critique. The suggestions made the jurors definitely provided some interesting things to think about and gave Bridget some ideas on how to reconsider certain elements within her design. In terms of Orders of Worth the jurors touched upon several categories. The critics focused on three things: the roof, materiality, and site design. The roof comments mainly focused on the Industrial Order of Worth. They appreciated the efforts in sustainability but thought that it could be improved. Their comments about materiality stemmed from the Inspired Order and the Market Order. The comments about the site were directed at the Domestic, Inspired, and Market Orders. The People’s Firehouse established by the people for the people boasts its history and tradition. The site for the proposed firehouse located on a prominent corner in the warehouse district on the water addresses the streets of Brooklyn by responding to the extended street grid through the site. The resulting form and spaces take cues from the established grid. The apparatus bay is positioned along the main street, Franklin Street, for quick exit and entry during calls. The office and visitor center are located on the main corner of Franklin and Quay Street adjacent to the apparatus bay. The west side of the building faces Manhattan and Bushwick Inlet Park framing a nice view for the residents of firehouse as well as visitors. The North side of building stacks the program so that the ground level is mainly occupied by the public while the second and third floors are for the firefighters. The third floor is the main residential space with an interior courtyard to allow ample light into the bedroom space and an occupiable green roof for grilling adjacent to the kitchen. A slide is located outside of the bedrooms so that call response time is decreased. The South side of the building houses an abundance of storage with a fitness room located above overlooking the apparatus bay. The spaces utilize an efficient circulation path for decreased call response times as well as easy navigation for public visitors. The materials used in the building consist of glass, steel, and metal sheathing. These materials reflect the surrounding buildings creating a cohesive urban fabric. By addressing the history of Brooklyn through the spaces created within the building and providing large public access areas, the new People’s Firehouse will continue to protect the neighborhood of Greenpoint in Brooklyn, New York, while maintaining its historical identity in the gentrifying scene. Thesis: Designing an environment that engages and stimulates employees through the fives senses leads to a more productive work environment. Since the invention of the cubicle, mundane office life has plagued the working environment. This day in age employers have made efforts in trying to make the office a more comfortable and productive working environment. Big corporations like Google have resulted in building office spaces essentially comprised of adult playgrounds so that their employees feel appreciated and enjoy their working environment. While this seems great, what about the small businesses that cannot afford to build outlandish spaces? Designing an environment that engages and stimulates employees through the five senses leads to a more productive work environment. Studies have shown that designs that respond to the five senses are more successful than those that do not. Jinsop Lee, an industrial designer, gave a TED talk in 2013 about design that engages the five senses. He explained through his own sensory chart as well as an experiment his friend did in college that activities that included all five senses resulted in better experiences than those that just responded to one or two. While in college Jinsop Lee was asked to design a clock that used the sun. While he thought he was clever in using a sunflower, his classmate was more successful because he used cups of scented oils to tell the time. By appealing to more than one sense, his classmate made a more desirable and ultimately more successful product. The ability to appeal to the senses in architecture, specifically in small offices, creates more engaging spaces that people want to inhabit. Designing a space to be visually pleasing is one of the most common ways to create an interesting space. People like to be visually engaged with their environment and one of the simplest ways of doing this is by incorporating color. Offices are now painting their walls with bright colors both to “reflect employee tastes and personalities, plus company mission and culture” (Mokop). According to Heather Holz, bright colors have been proven to improve focus and energy. It has also been noted that different colors evoke different emotions and therefore their evocative nature should coordinate with the space in which it is used. For example, blue reflects a quality of calmness so it should be used in spaces like reading rooms or personal offices. Colors such as orange and yellow are more stimulating so they should be used in spaces such as conference rooms that generate a lot of discussion and collaboration (Holz). Another very important aspect to a healthy and productive office environment is natural light. 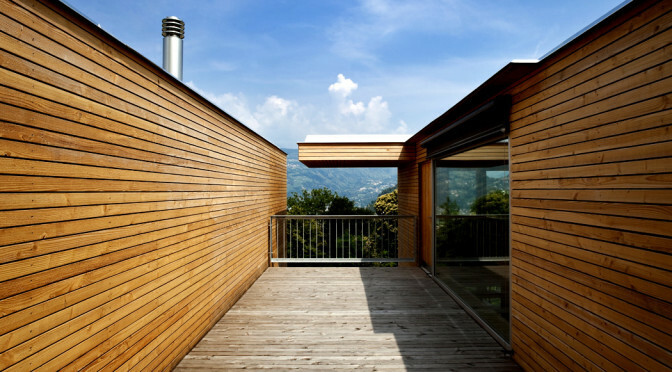 Sabret Flocos said, “being able to see the outside world has restorative influences” (Holz). Stephen Kellert also argues that people enjoy spaces that utilize the natural environment and by using translucent materials such as glass to provide an abundance of natural light, the work environment will be enhanced. A well-lit working environment is not the only benefit from the use of natural light; it also can contribute to solar gain, which in turn lowers heating costs and creates a sustainable environment. Due to the expense of glass and the constant need for cleaning, the firm Simon Bush-King Architecture & Urban used OSB with CNC cutouts to break up direct views and let light into the office space of Superheroes in Amsterdam, Netherlands. The material not only provides economical benefits but also provides an interesting backdrop for the office. After sight, sound is one of the most important factors to consider in an office. These days the open concept plan is popular because it allows flexibility and promotes collaboration; however, workers tend to get distracted or annoyed with phone calls and surrounding conversations when they are trying to work. One way of avoiding this would be to organize the space so that activities that require collaboration are grouped together in one space and work that requires more individual concentration in a more private setting. Another strategy is to add vegetation or use materials that absorb sound such as cork or felt. Hard surfaces reflect sound whereas plants absorb it (Fedele). Using plants to divide spaces will help damper the conversation in that area instead of reverberating throughout the office while also promoting a healthy environment through natural air filtration. Because plants require constant maintenance and do not absorb a majority of the sound, another option is to use felt. Felt absorbs sound thus creating a quieter environment. 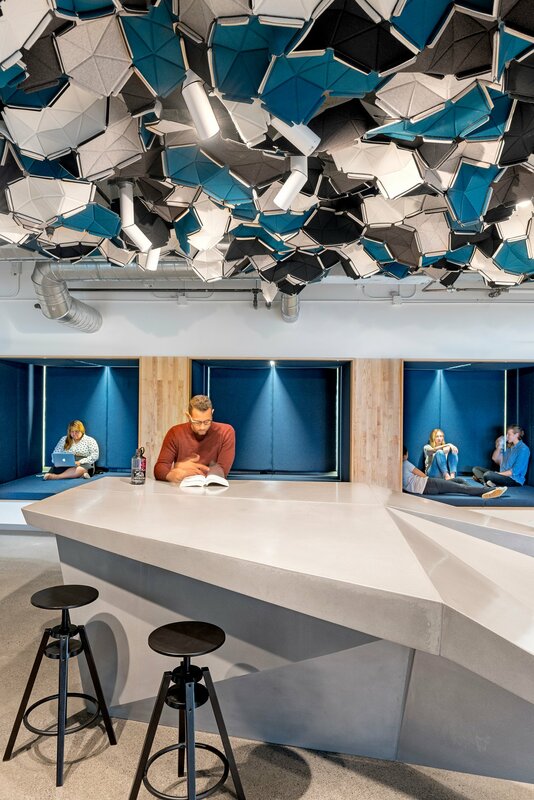 Studio O+A used a felt installation on the ceiling in the startup company Livefyre’s engineering workspace. The engineering department wanted the best of both worlds, collaborative and individual spaces in one. To create the individual spaces they designed soundproof booths in the walls that are both silent and comfortable. Out the five senses taste is the most difficult to design for, but if taste is not taken literally, but rather the sensation of taste, people will associate this sensation with specific instances. If literally tasting architecture is out of the question then what taste reminds us of should be considered. Certain textures and colors can remind workers of food or the feeling of food, like a rich cream color could remind one of ice cream. As Junhani Pallasmaa explains, “vision becomes transferred to taste as well; certain colours and delicate details evoke oral sensations.” These techniques could be used in the break room of the office so a lunch break is more enjoyable. Another sense that tends to employ difficulties is smell mainly because people are sensitive changes in scents. However, the sense of smell is extremely powerful in triggering memory. “The most persistent memory of any space is often its smell” (Pallasmaa). One way to stimulate the sense of smell in the office is by lighting candles or by having certain potted plants that give off a pleasant aroma. The use of plants also doubles as a sound barrier therefore the senses of sound and smells are appealed to creating a more dynamic space. Other tactics such as releasing different scents throughout the day will keep employees alert and deter watching the clock. In the case of Evernote, a small software company in San Francisco, they placed a café at the entrance with a barista that also functions as receptionist. By placing a café at the entrance, people know when they smell coffee or pastries they are near the entrance. People are fascinated by the sense of touch hence the creation of the Please Touch Me Museum. Texture can really set the mood for a space. Carpet and wood set a homey feeling whereas steel, glass, and hard stone have a cold, harder feel to it. 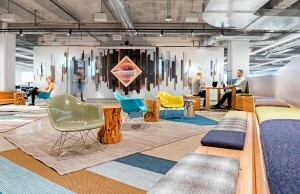 Livefyre’s office creates a homey feeling for its employees by using wood and different carpets. Designing for touch is important because people are in constant contact with the world around them so creating a space that is comfortable to the touch reflects people’s mood. Creating an enjoyable and comfortable workspace for employees is the most important thing a company can do and as designers we have the ability to put this thought into action. Designing spaces that focus on all of the senses could lead to innovative office strategies. By stimulating workers through the five senses and providing an engaging environment people actually want to work in, office morale increases which leads to higher productivity. From an initial glance, the boards are clear and descriptive. As one moves closer to further examine the drawings provided it is apparent that the proposed building has a prominence on the main street of the site. As explained in the project statement, Stephanie is addressing the past industrial heritage of Brooklyn as well as looking to the new of Manhattan by situating her building as a hinge between the two. She has placed her community-involved program facing the streets of Brooklyn while her more private residential program is ‘twisted’ to face the view of Manhattan over the East River. By twisting her program to address the various views of the site, Steph has strengthened her design intention of creating a hinge. As Steph walked the jurors and those in attendance through the building, there was an emphasis on a core circulation scheme that various program stemmed off of. As one moved through the building the privacy of the spaces increased. On the ground level facing the main street, Franklin Street, the apparatus bay, which can park six fire trucks, is sandwiched between two other programs. On the right along Quay Street, a secondary street, the various storage components of the program are located. By placing these spaces far away from the community, Stephanie is protecting visitors from potentially hazardous materials. To the left of the apparatus bay, Steph has located the main lobby and crisis rooms for the public. Using the apparatus space as a separation between private and public programs is very effective and provides adequate separation between hazardous material and the welfare of the general public. As one moves up the central circulation space they enter into the living area of the firefighters. This space is twisted away from the main street to frame a view across the river towards Manhattan. The jurors critiquing the project said this gesture of twisting the living quarters off of the top of the apparatus bay was unnecessary. Although it does frame a nice view of Manhattan, I agree with the jurors that this twisting of the building is unnecessary. By placing the living space directly on top of the space below, the awkward spaces that we formed on top of the apparatus bay are avoided and the view of Manhattan is still in tact. If Steph were to keep the twisting of the space, I would suggest further programming that space as was hinted at during the review. I would suggest adding an outdoor recreation space or patio space so that the fire fighters do not have to walk downstairs to workout. It will also give them a sense of escape from the public’s eye since the fitness room is currently located on the bottom floor near the public lobby. Also if the twist were to move forward, Steph needs to decide on the angle of the twisting as suggested by the jurors. The current angle seems unrelated to the site and therefore, produces an awkward space both below on the park and the workspace. As one moves to the top level of the building, one walks into a very spacious recreation room. I had similar layout in a design last year where I had the workspace on the bottom level, the living space in the middle, and the recreation space on top. Although this is a nice scheme, I think it would be better to have the living space at the very top. By doing so the people sleeping do not have residual noise leaking through the floor from those hanging out upstairs. This suggestion may pose the problem that by moving the living quarters up another floor it will be increase the response time. However, with the flexile chute proposed I do not see this as a significant increase in response time. Apart from the building, there were several comments made about the design of the site. One of the critics repeatedly said that Steph has made an urban pocket that connects back to the main urban fabric of the city. They appreciated the intention to maintain this urban fabric and the continuity of density but also the notion that the use of the space is left open to the user. However, the jurors also suggested that a “pocket of landscape” should also be considered. Because Steph is continuing the secondary street, West Street, through the site so that the apparatus bay is accessible from both Quay and Franklin Street, she should consider looking back the site history and the history of roads. It was mentioned that West Street had originally run through the site and by looking back on previous site plans it may be useful in devising a strategy that relates back this past since there is an intention to continue the urban fabric of the city. Another suggestion made by one of jurors was to push the entire building to corner edge condition. Right now Steph is not fully addressing this prominent corner that most have seen as gateway for the site to engage and welcome the community in. 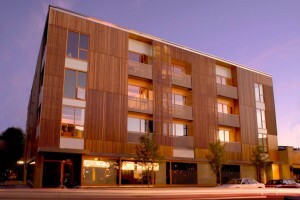 By pushing the building to the corner it creates more of a dominant presence in the community. 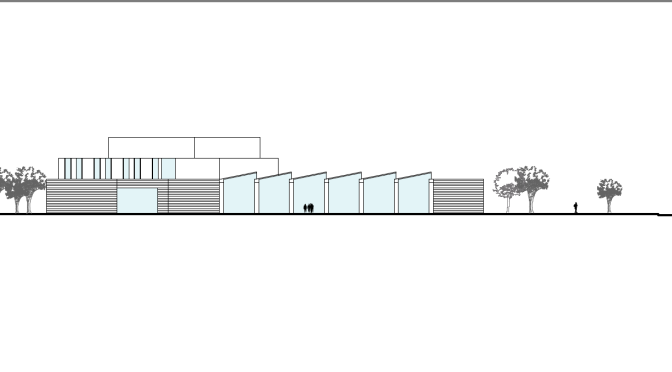 If Steph were not to move the building to the corner because as it stands the interior spaces located on that corner are where hazardous materials kept, I would suggest placing employee parking or a well-developed green space that leads people to the park on the backside of the site. As for the area on the backside of the Monitor Museum, it definitely needs more development. Steph had mentioned there is a proposed beach that she intends to build off of. Although I enjoy the idea of a beach in the city especially since the site includes a maritime museum, I think if a beach were to be included in the site there would also need to be an area for water treatment. Usually when people see beaches they want to jump in the water so there would need to be an area with treated water safe enough for people to enjoy. As a whole the entire site needs to be designed more because there is no real transition from green space to asphalt to beach. Overall Steph had a very informative and helpful critique. The comments made generated suggestions that I think will be useful in going forward. In terms of the Order of Worth, the critics spoke mostly about the Civic and Industrial orders. In terms of the Industrial Order, the appreciated the efforts for sustainability specifically the saw tooth roof that uses solar panels to capture the sun’s energy to heat the apparatus bay. They did mention to explore this idea further and possibly implement it in others of the project. In terms of the Civic Order, they spoke mostly about the site development of the site and how it relates to the community. They offered suggestions of creating plaza spaces as well reexamining the proposed master plan of the site. They also mentioned creating a hierarchy within the spaces and how the central core of circulation connects these spaces.